Dana Innovations will mark its 35-year anniversary with multi-day open house festivities during CEDIA Expo 2018 for its Sonance, Trufig and iPort brands. SLS speakers to highlight booth. Sonance SLS Landscape Series speakers will be shown for the first time on U.S. soil at CEDIA Expo 2018, says Josh Blanken, director of product management at Dana Innovations. Dana Innovations (Sonance, Trufig and iPort) is taking advantage of the close proximity of the CEDIA Expo 2018 to host an open house to celebrate its 35th anniversary at its new impressive facility just up the freeway. Based in San Clemente, Dana Innovations is chartering shuttle buses on Friday, Sept. 7 and Sat., Sept. 8 to bring attendees to its new facility, which features multiple training rooms, demo areas and a large community area with foosball, ping pong, shuffleboard, a golf simulator and other fun activities. Integrators must register to attend the event. Buses will be operating in the afternoons through late in the night both days. The open house certainly won’t overshadow Sonance’s presence at the show (booth #4901). The company will be showcasing for the first time in the U.S. the next generation of SLS landscape speakers and subwoofers. 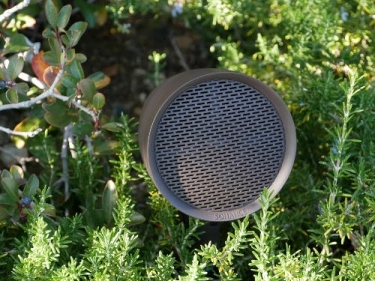 Redesigned and engineered for outdoor spaces, the new SLS speakers bring high-performance audio to the great outdoors. Strategically placed satellite speakers and subwoofers encompass the perimeter of the property, directing the sound toward the listening areas. The result is detailed playback at any volume. Designed using performance features borrowed from Sonance Professional Series and Visual Performance Extreme, Sonance Landscape Series boasts a completely immersive and flexible performance-driven outdoor experience. With the introduction of the Sonance Laminated Core Transformer and adjustable tap, Sonance Landscape Series speakers and subwoofers can be configured for 70V/100V or 8 ohm system designs. Set to 8 Ohm, the SLS system can scale down for patio applications at low volumes. The ability to adapt the system for 70V/100V applications allows for larger scale systems that require greater area coverage. “We will also be showing our Visual Performance ultra-thin line speakers,” says Josh Blanken, director of product management. The speakers are just 36.2 mm deep, well suited for MDUs or drywall on concrete. Meanwhile, iPort will be showing its Luxeport charging stations, and Trufig will have its new flush mounting system for the Josh.ai voice control module. Immediately adjacent to the Sonance booth will be Sonos, which just announced a partnership between the two firms. Sonos will have the new line of architectural speakers designed by Sonance.